Join Tamara, from our National Anti-Bullying Youth Board as she shares her advice to become body confident. Tamara believes that everyone should have the right to be who they are and not get discouraged for it. She’s on a mission to let everyone know it’s alright for them to be who they want to be. Today, we live in a world where a lot of us try to conform into the pressures of beauty standards so that we fit in with the rest of the world. Each day, courtesy of the media, we see unrealistic expectations for our bodies just so that we can be identified as beautiful. This has become our “normal”; seeing models and celebrities edited to look their very best and it exceeds reality. Many of us look at these images thinking why we can’t look like them, or hope to be as beautiful as these people one day without knowing how much make up and editing has gone into these images to make them seem perfect. 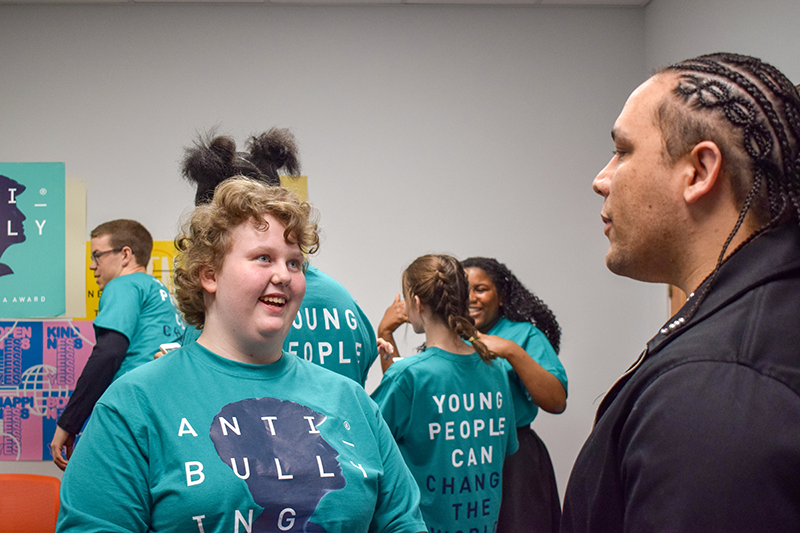 Tamara with Diana Award Deputy CEO Alex Holmes at a National Anti-Bullying Youth Board Meeting. Now, we need to help each other to realise that we should only be confined by our own beauty standards; no matter what it is, fat, skinny, tall, short, dyed hair, natural hair, piercings and tattoos. We need to help each other and remind ourselves that we look at their best without editing and without make up and boost everyone’s body confidence. Body image is mental and emotional: it’s both the mental picture that you have of your body and the way you feel about your body when you look in a mirror. Having body confidence means that you have a healthy body image which is more than simply tolerating what you look like or “not disliking” yourself. A healthy body image means that you truly accept and like the way you look right now and aren’t trying to change your body to fit the way you think you should look. It means recognising the individual qualities and strengths that make you feel good about yourself beyond weight, shape or appearance, and resisting the pressure to strive for the myth of the “perfect” body that you see in the media, online and in your communities. Having a healthy body image can lead to a boost in confidence, you feel as if you can do anything because you are at your best. 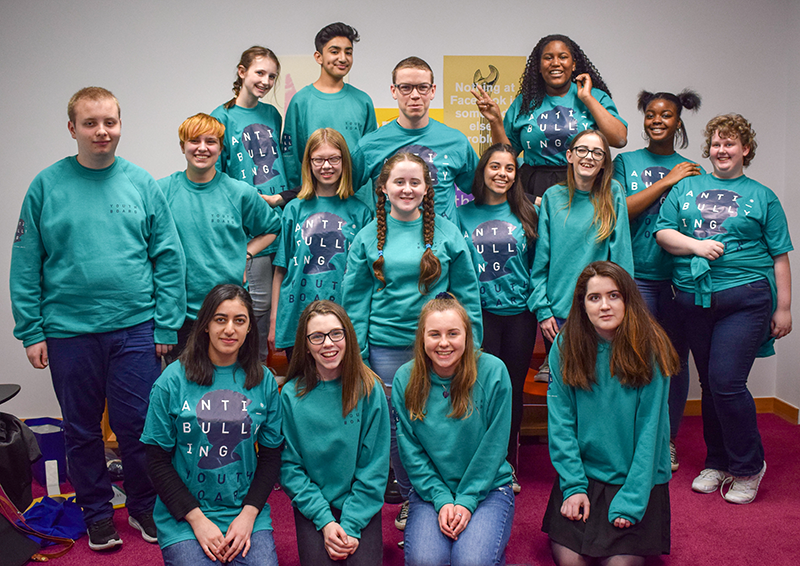 The 2018 National Anti-Bullying Youth Board at a London Meeting. To have a good Mental Wellbeing, you need to think positive and have a good mind set. Instead of dwelling on the bad things in life, focus on the good things, the people who are there for you and stand by you. Trying to have positive thoughts can be very tough, especially if you’re having a bad day, or someone/something has annoyed you, but you can have a positive start to the day. Just look in the mirror when you wake up and come up with a quality about yourself which you like, each morning you should come up with a different quality. This does not have to be something physical like your appearance or the clothing you wear, it can also be something mental, a characteristic: are you kind? Do you have a good sense of humour? Maybe you have a secret hidden talent which you do not show anyone. Collectively, you will have so many good things to remember about yourself and reasons why you should love yourself. By thinking of all these things, you will have a wall of positivity which will only continue to grow. If someone manages to break the wall just slightly, you can always fix it by continuing to think of the good qualities which you have. Thinking of your qualities and characteristics which you like can lead you to being happier which means you will be starting to have a good or even better wellbeing. Please note that this is a guest article and any views, information or opinions expressed do not necessarily represent those of The Diana Award or its employees.